Teachers and trainers working in vocational education and training (VET) are key actors to ensure its quality and relevance to today’s demands. They play an essential role in the implementation of reforms that have been part of the EU and national agendas. Cedefop supports the development of EU policies that affect teachers and trainers through targeted activities and as a transversal topic in other related projects, such as learning outcomes, renewal of VET curricula and early leaving from education and training; work-based learning and apprenticeships. applying the common European transparency tools. It is essential that teachers and trainers have opportunities to develop and keep up to highest standards their technical competences, pedagogical skills and transversal competences (e.g. digital, intercultural communication, and others). Teachers and trainers’ professional development continues to be high on the EU policy agenda. 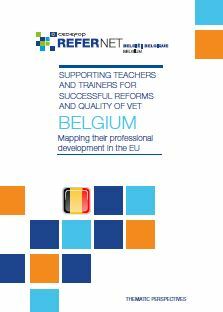 In 2010, the Bruges communiqué (2010) invited Member States to invest in VET teachers and trainers by offering flexible training provision. The Riga conclusions (2015) have put renewed emphasis on the issue, calling for more systematic approaches and more and better cooperation and partnerships. 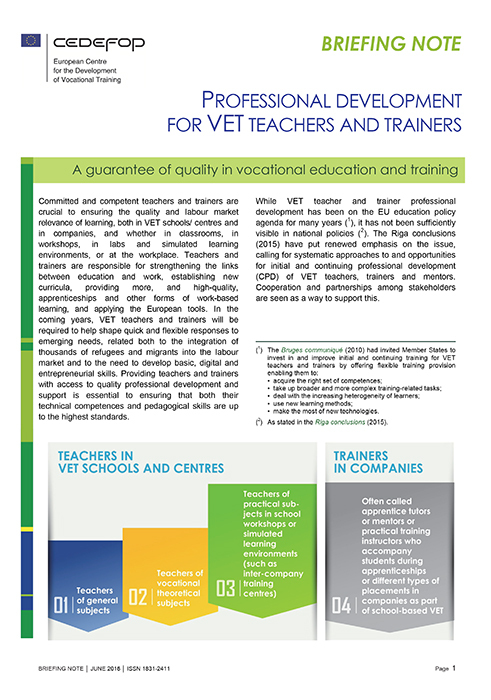 and a briefing note, ‘Professional development for VET teachers and trainers: a guarantee of quality in VET’. In November 2016, Cedefop is organising a policy learning forum on supporting professional development of teachers and trainers for better VET. Cedefop provides expertise to an ET2020 working group on VET (set up by the European Commission) that in 2016-18 focuses on professional development of teachers and trainers. The group specifically addresses governance and partnership arrangements between schools and companies. Cedefop also studied competence development of those employees who work with adult learners in continuing vocational training (CVET) and in enterprises. The publication, ‘Trainers in continuing VET: emerging competence profile’ (2013), discusses a competence profile of a trainer that emerged from the 19 examples from the Member States on developing competence requirements to trainers working in institutions for CVET and in companies. The publication, ‘Who trains in small and medium-sized enterprises: Characteristics, needs and ways of support’, reports the results of a survey of in-company trainers and employers from 254 SMEs from eight Member States on the roles, qualification and competence needs, tasks and activities, awareness of publicly-supported measure for professional development of those employees who train others in their workplace (most often in additional to their duties). competent trainers in companies matter: make them part of a broader agenda and use all available funds and programmes. Support for trainers’ competence development in small and medium-sized enterprises, France and Germany, October 2013.